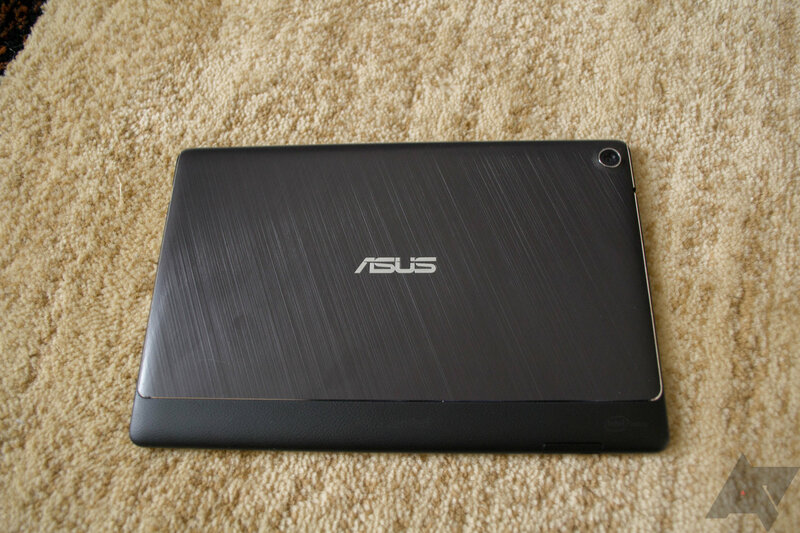 Asus was one of the first Android tablet OEMs to distinguish itself with devices like the original Transformer, and it followed that up with two 7-inch Nexus tablets. While Asus is no longer the Nexus tablet maker of choice at Mountain View, it's still doing some interesting things with Android slates. 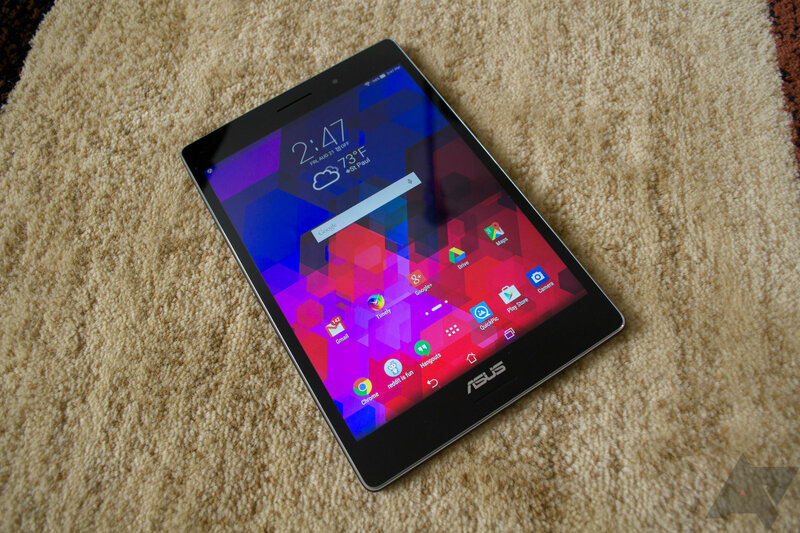 After a run of heavily budget-oriented tablets, Asus is launching a somewhat more premium offering, the ZenPad S 8.0. As the name implies, this is an 8-inch Android tablet with a very similar vibe to the Zenfone 2. Depending on how you look at it, that can be either good and bad. Display 4:3 screens are just better on tablets, and this one is really great. It's sharp and has excellent viewing angles. Design The ZenPad S is super-thin and very light for an 8-inch slate. Battery life This thing gets insane standby battery life, and general use is a little above average despite the smallish Li-ion cell. Performance Generally very responsive and quick to launch apps. Price $299 for the version with 4GB of RAM and a solid Intel SoC is a good deal. The $199 version is good for the price as well. The software Oh, Asus. It's nice that you're trying, but maybe try a bit harder? 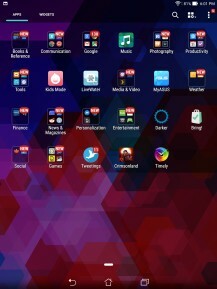 Most of the included features are of little use and there are so many bloatware apps. It's also still based on Android 5.0. Charging No support for QuickCharge 2.0, so it takes a few hours to charge completely. Performance again There were a few minor performance hitches, mostly while playing games. Materials It's all plastic, and I worry how it'll hold up over time. The Asus Nexus tablets offered a great value, but I think the build quality always suffered because of it. They felt vaguely slapdash to me, and tended to get creaky and weird after only a short time out of the box. At least in initial quality, the ZenPad S feels like a more premium device. I've noticed one area of the tablet that's a little noisy if I squeeze it, but that's all. The back is mostly composed of smooth textured plastic (fake brushed metal), but there's a strip of soft touch plastic that runs along the bottom (when held in landscape). This section has a faux-leather texture, and it actually feels rather nice. 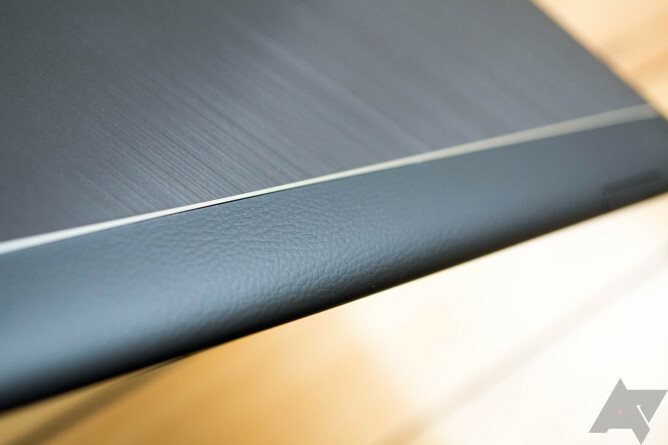 The soft touch runs all the way along the edges of the tablet, which gives it a little more grippiness in the hands. 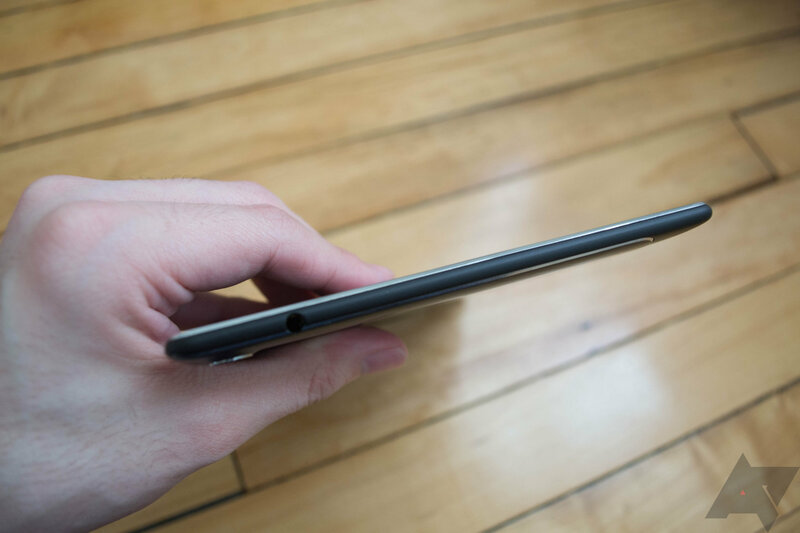 The ZenPad S 8.0 is only 6.6mm thick and weighs 298g. So it's probably much thinner than your phone and it's not really that much heavier than a big phablet. This tablet has a 4:3 screen ratio like the Nexus 9 or iPad, so it's not quite as easy to grapple in one hand as other 8-inch Android slates, but I think it's overall considerably more comfortable to use for long periods than, say, a Shield Tablet. If you've got average-size hands, you should be able to wrap your fingers all the way around it. The volume toggle and power button are found along the right edge of the tablet (in portrait). The volume toggle is nice and clicky, but the power button seems weirdly mushy. It's not terrible by any means, but for buttons that look almost the same, it's weird that one would be noticeably more tactile than the other. Opposite these on the other side is a microSD card slot with a port cover that seem sturdy enough. 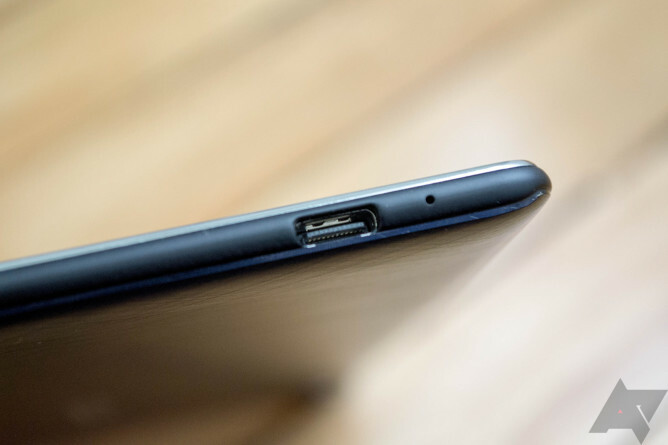 Down at the bottom is something you're going to be interested in—a USB Type-C port (only on the $299 version). It comes with a single cable to charge, which ends up being an unpleasant reminder of what it was like in the old days. Remember? Back when tablets came with proprietary power cables? USB Type-C is the standard of the future, but right now it might as well be a one-off. If you're anything like me, you've got microUSB cables all over the house. To suddenly have this one cable for this one device is inconvenient. This isn't Asus' fault, but have you priced Type-C cables lately? Yikes. Plugging in a Type-C connector to this device is just like plugging in a microUSB, except you don't have to feel for the pointy bits in the dark to figure out which way it goes. This device doesn't support quick charging like the ZenFone 2 does, but Asus says that's not because of the Type-C port. This is a real bummer. As I mentioned above, this tablet has a 4:3 screen like the Nexus 9. It's also the same resolution at 2048x1536. So it's a little smaller than the Nexus 9 with the same resolution, meaning a slight bump in pixel density compared to that device (320 ppi). The screen looks extremely clear and the viewing angles are terrific. There's no dimming or color shifting even when you get way off-axis. The display does get very bright, but strangely, only in manual brightness mode. The auto-brightness setting felt way too low to me in almost all lighting situations. You have to be in fairly bright direct light for the auto-brightness level to go much past 30-40%. The screen also looks slightly over-sharpened in places, but it's not as egregious as some other devices I've used. The default colors look fine to me, but I'm admittedly not too picky in this area. 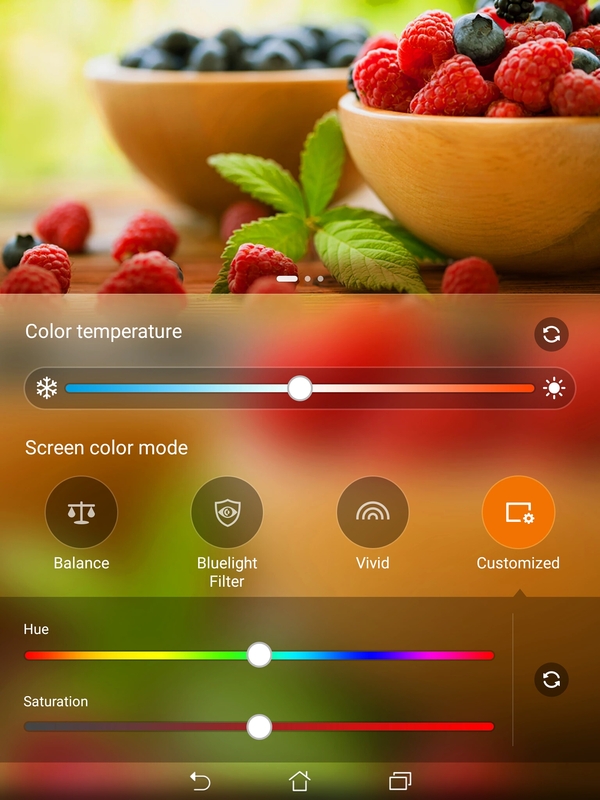 If you like things to pop a little more, Asus has a few different color modes in the settings. The default is balanced, but you also have vivid and "BlueLight." There's also a full custom mode where you can adjust the hue, saturation, and temperature to your liking. It's overall a great tablet display. Front facing speakers are, thankfully, becoming standard for tablets. The ZenPad S has two of them pointed right at your face, which makes for a good gaming experience. For music, I think this tablet actually performs well. You can crank the volume up pretty high without getting any distortion. The sound they produce is clear and loud, but there's really no bass, like at all. It's a crazy-thin tablet, though, so that's to be expected. If you just want to watch a music video or play some tunes while you clean the house, I'm sure it'll be fine. Before we get started here, just let me remind you that battery usage varies considerably from one person to the next. You might use a tablet to play games frequently, so you'll see less screen-on time than others who only read books and browse Reddit. I'll try to explain my usage in this section so you can make an estimation of how the ZenPad S will perform for you. Asus only lists the battery capacity in watt-hours, but converting to the more conventional milliampere-hours, we're looking at a 4000mAh battery in this tablet. 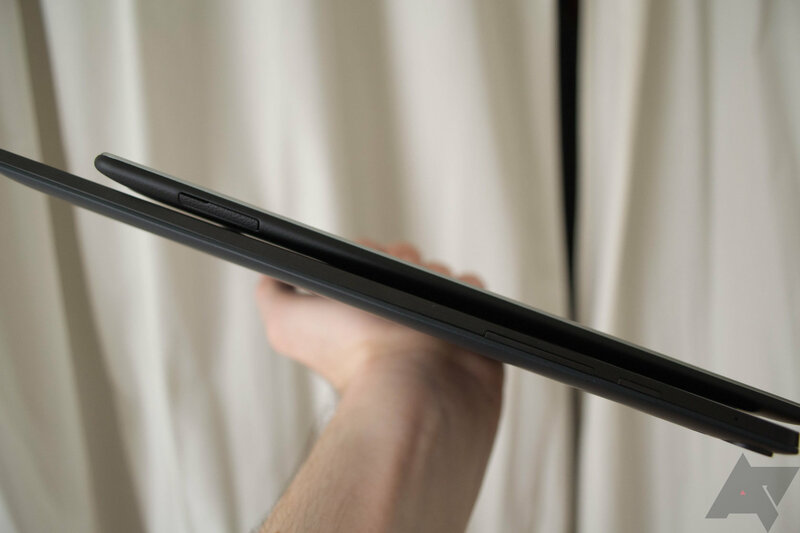 It's a little on the small side, but again, this thing is really thin. Because there's no quick charging functionality, it'll take a bit over two hours to charge the ZenPad completely. You know how I lamented the scarcity of Type-C charging cables above? I was maybe being a little dramatic because you really don't have to charge the ZenPad all that often thanks to it's killer standby time. I haven't even been bothering to plug it in overnight because it loses maybe 2% by the time I wake up. Intel's chipsets tend to be really efficient with WiFi-only devices, so I guess that's no surprise. As for actual usage, I'm seeing about six or seven hours of screen-on time with mixed usage including about a third gaming, a third reading, and a third general browsing/Redditing. That's about average for a good Android tablet, but a little more impressive considering this device only has a 4000mAh battery. I haven't really made any tweaks to the device to improve battery life, except for disabling and uninstalling some bloatware. 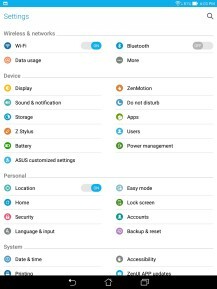 Asus has shipped the ZenPad S 8.0 with Android 5.0—that's it, no "dot" updates and certainly no 5.1. That strikes me as odd at this point considering how close we are to Marshmallow. 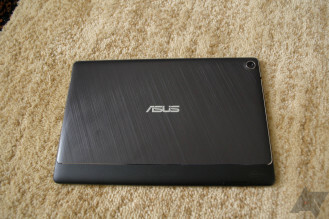 Asus hasn't said much about the future update situation for this tablet, so keep that in mind. In general, Android 5.1 consisted of bug fixes that can be integrated into older builds, but heads-up notifications are still more annoying in 5.0. 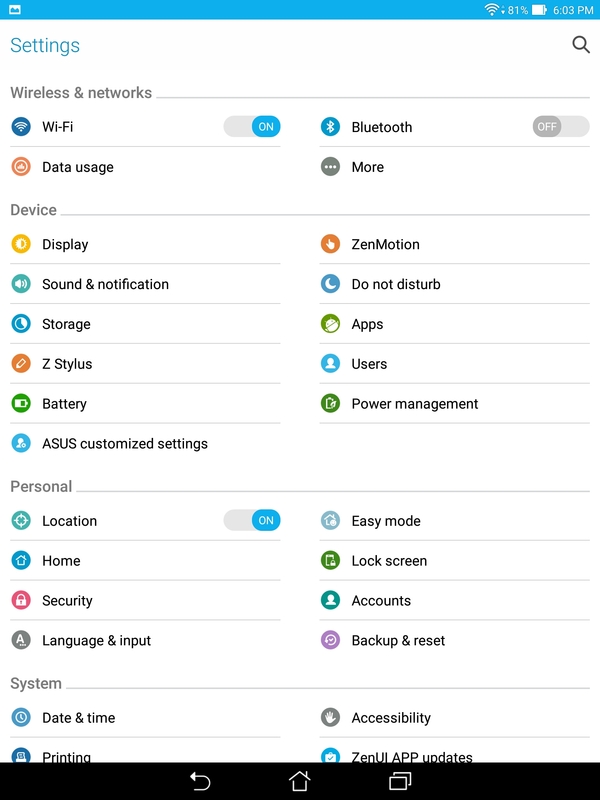 The handful of UI tweaks in 5.1 wouldn't matter here anyway, as the ZenPad S runs the same ZenUI skin as the ZenFone 2. If you've used one of those, imagine the same thing but bigger and you've got the ZenPad. 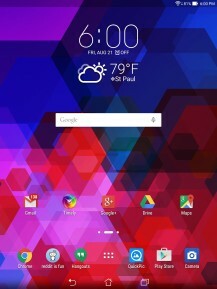 This isn't one of the nicer Android skins I've used, but it's far from the worst. The color scheme is acceptable, but the navigation buttons look very old-fashioned by current standards. The navigation shade toggles are a serious mess. Asus has a ton of built-in utilities as part of the system, and many of them have a place in the notification shade. For example, the quick settings area at the top of the shade contains links for the audio wizard, an auto-start manager (ugh), a note app, and a task killer (double ugh). The quick settings are configurable, so you might think you can just get rid of those shortcuts, right? Nope—you must have at least four of them, and there aren't that many useful ones. 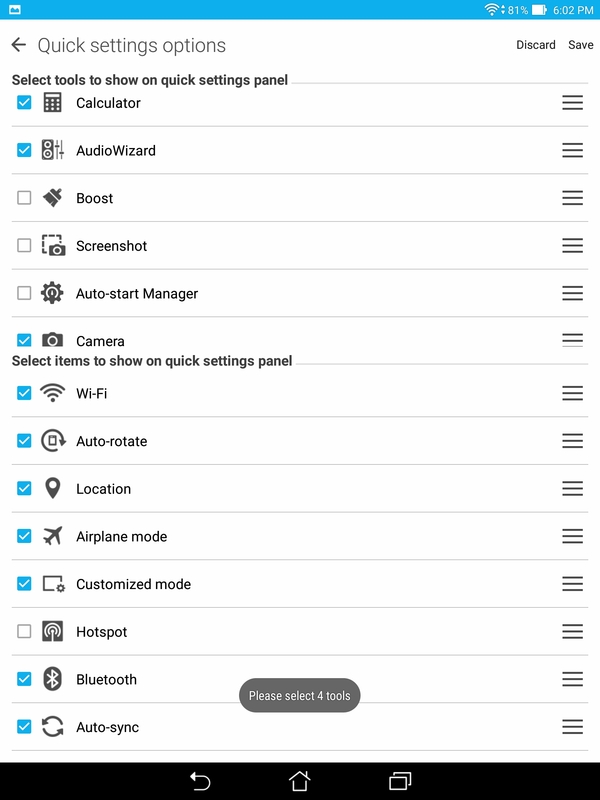 The bottom section of the quick settings is where you have the useful things like WiFi, Bluetooth, airplane mode, and so on. My other concern with the ZenPad's software comes in the form of a completely unreasonable amount of bloatware bundled with this tablet. Again, it's the same situation as the ZenFone, probably because Asus needs to bring the price down a little, and the developers of this stuff have money to pay for placement on devices. Such is life. You can remove and disable most of it, but the same cannot be said for Asus' own built-in apps. I can't imagine I'll ever want to use the Asus movie maker app, but it's going to remain in the app drawer anyway. There's also a battery manager app that notifies you of apps that are eating up too much juice, but it has no common sense. 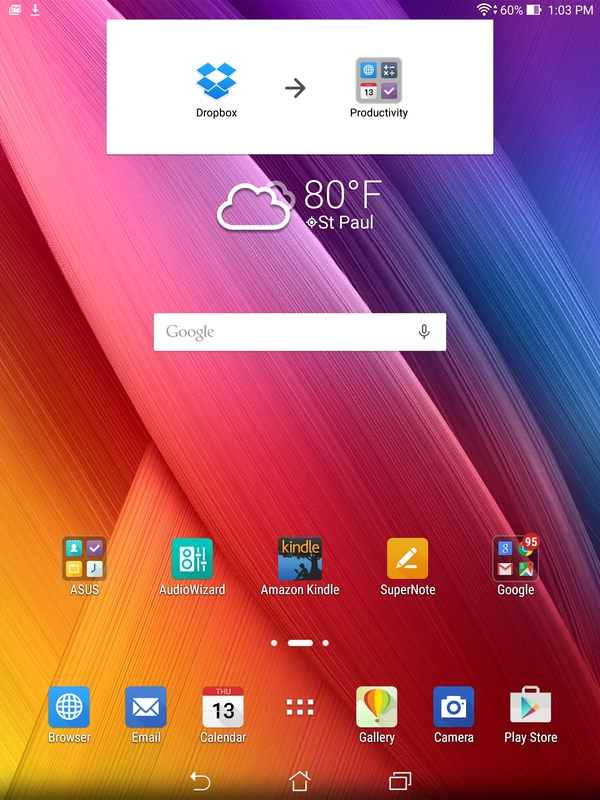 Yes, I know Google Play Services is running in the background, and no I don't want to kill it, Asus. Jeez. 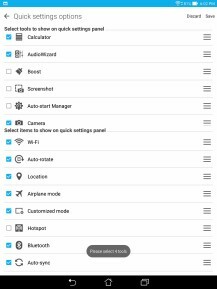 There are some useful additions to Asus' version of Android, including double-tap to wake. 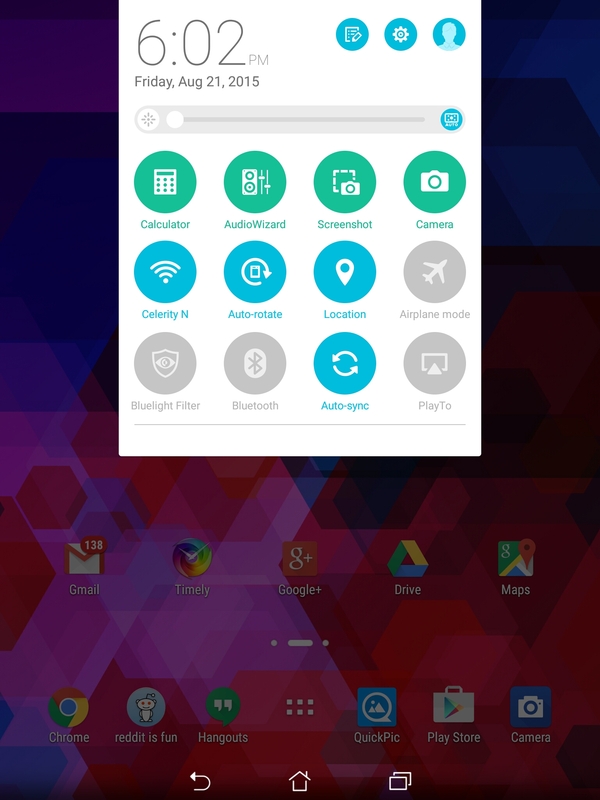 The default home screen also automatically categorizes apps as you install them and can place them in folders. It's actually really good at this. There are only a few things I've installed that the launcher couldn't find a place for. Antutu pulled down a score of 45013, just a little lower than the ZenFone 2. Understandable considering the higher resolution of the screen. The 3DMark Ice Storm Extreme benchmark managed a score of 7522, which is okay. It's higher than you'd see in budget devices powered by the Snapdragon 615 or 410, but still not as good as the GPU in a flagship device. Note, I'm using the 4GB version of the tablet with the faster Intel chip. 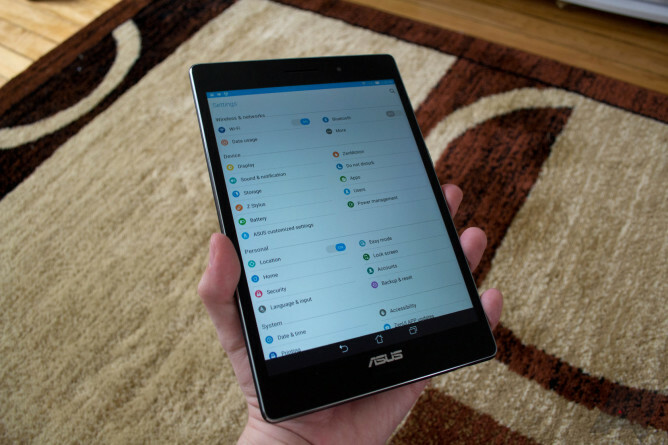 The ZenPad S feels faster in daily use than the Nexus 9 does, so that should make Asus proud and Google a little sad. The multitasking screen pops up reliably on the first try, and touch response is good. There's an occasional hiccup while playing a game, but otherwise I haven't detected any lag to speak of. As long as you don't play a lot of 3D games, you shouldn't see anything out of the ordinary. I suspect these minor performance issues also have something to do with the SoC heating up, as they're more pronounced after several minutes of gameplay. This version of the ZenPad S will run you $299. In exchange for your hard-earned money, you get a cool little tablet with a great screen and slim, attractive design. The $199 version has a slower Intel chip, 2GB of RAM, and only 32GB of storage. If you can swing it, I think the improved performance of the more expensive model will be worth it. I really have no substantive complaints about the hardware, but in the interests of thoroughness, it might be nice to see a little metal in the design for added strength. I worry that the ZenPad will start to develop strange creaks over time as it's all plastic. Likewise, a bigger battery and Quick Charge would have been appreciated. The thing about these complaints, though, is that they're moot when price is taken into consideration. A tablet with a high-resolution screen and reasonably powerful internals can't cost under $300 if you start demanding this and that. It's also missing a vibration motor and NFC, but those aren't really a necessity in a tablet as far as I'm concerned. I feel like Asus made the right choices when designing the hardware. I do have reservations about the software. I think I'd be head over heels for the ZenPad S if it were a Nexus device, or at least shipped with something closer to stock Android. 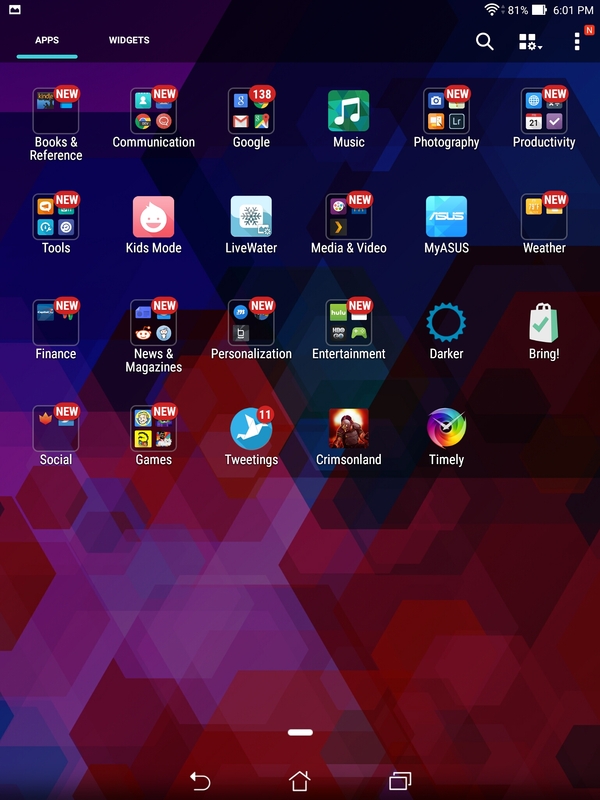 There's just so much bloatware, and Asus' custom features are useless at best and downright annoying at worst. Despite the software issues, I enjoy using the ZenPad S, and you probably will too if you decide to drop some cash on it. It's a very good tablet, and dangerously close to being great.